So Jeff Bezos Said “Wait For The Wave To Catch Up”, But How Do You Know You’re On The Right Track? The response I received from yesterday’s post THE Lesson From Jeff Bezos That Kept Me Going has been pretty cool. I appreciate everyone who reached out. I received a great email via LinkedIn from Todd Reed. I sat down to reply quickly and, well … I started to riff. Todd allowed me to post his question here, and what you see below are my raw thoughts. I’m curious – how did you narrow down to this point of WD (Wholesale Distribution) – UnleashWD, the conference, the podcast? You’ve always been a passionate guy. Reading your Bezos story got me thinking about how you knew this was the way to go. And when you didn’t get the results in the first year, how did you keep it together that you were on the right track? Todd, thanks for reaching out! Great to hear from you and I know you’re ready to ROCK 2016! Really appreciate the questions. I’ll try to answer without too much riffing (which I tend to do!). This decision was made 20+ years ago due to constraints. I was trying to be all things to all people, and while our sales and management systems, tools, etc. are equally as applicable for say banking as they are to WD I couldn’t market myself to everyone. Nothing scientific here. I had a constraint – time, money, and bandwidth and a decision had to be made. I had some success with Berlin Packaging and Morgan Distribution (eventually bought by Andersen Windows) and I declared that I was a WD consultant. OK a Riff… As I typed that last sentence, it sparked this. In my speeches now about Innovation and compelling value propositions, I talk about having to stand for something – ask yourself what do you dare to declare. What is your brave point of view? Todd, here is a short video of me speaking about this subject, referencing what I learned from Wendy Clark formerly Coca-Cola’s president of sparkling brands who recently became CEO of DDB North America. In hindsight, many years ago I declared I was a WD consultant. Head down ever since. That said, I still get non WD business over the transom but zero energy is spent searching it out. By focusing on that niche, I learned with every interaction, and thus was able to bring new insights and expertise to each successive interaction. What will you dare to declare? What is your content pivot? This last one – content pivot – comes from Joe Pulizzi of Content Marketing Institute. Knowing you have something to share with the world Todd, I recommend his book Content, Inc.
His premise, every topic is taken. So you have to pivot the content just a bit to make it yours. For example, I’m focused on innovation. Is there more of a buzz word today than innovation? Everyone is talking about innovation. In fact as I type I googled “Innovation Podcasts” and over 13 million hits come up. Certainly there aren’t that many podcast shows but … Innovation is ubiquitous. So how do you break through? You have to pivot your content. Todd I stand for embracing this age of disruption that we find ourselves and that your relevancy (as a business or individual) is not guaranteed. That you as a leader have been “called” at this unique moment in time to not manage your business for today, but to lead your business into the future. I published my manifesto stating very clearly what I believe in. 34 beliefs as you saw on today’s email that is a “lens into my soul.” If that doesn’t say belief (not to mention the title of the manifesto “I Believe”) I don’t know what does. The research (talk to me about the value of doing research – its invaluable) on innovation in WD led to my book INNOVATE! How Successful Distributors Lead Change In Disruptive Times, I discovered a model that I have trademarked as The Innovative Distributor™. There is my pivot. I am no longer lumped in the sameness trap of simply “innovation” with the 13 million others. 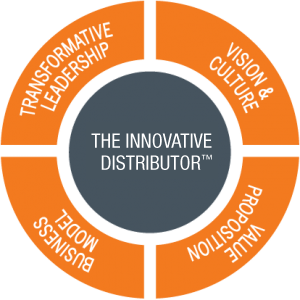 I own The Innovative Distributor™ its mine, its unique, and it’s my pivot on Innovation. BTW – thanks for asking I’m learning a ton as I type all this out. Well I wish I could tell you that I had a crystal clear vision. That I could have articulated exactly how things were to work out. That I new the path. That I new exactly what my platform (which has become pretty substantial in the fours years since I’ve launched UnleashWD to a rousing failure) would be on this date four years later. That I was always 100% confident of what I was doing. That I knew beyond a shadow of a doubt that every speaker I put on the UnleashWD stage would ROCK our world. Truth is, I knew none of that. But I took the first step, and then the next. And something inside me said I was on the right path. But that inside voice was reinforced by those I touched. For example, when I had the idea that innovation was bypassing WD, again just an idea. Was I right? I had no clue. So I picked up the phone and called ten CEOs … “Hey Joe I have an idea… can I bounce it off you. Tell me honestly what you think.” Not only did they reinforce my thought, but they expanded it and helped shape a very pliable vision. I remember going into the office one Saturday – I locked myself in the room after making those calls. 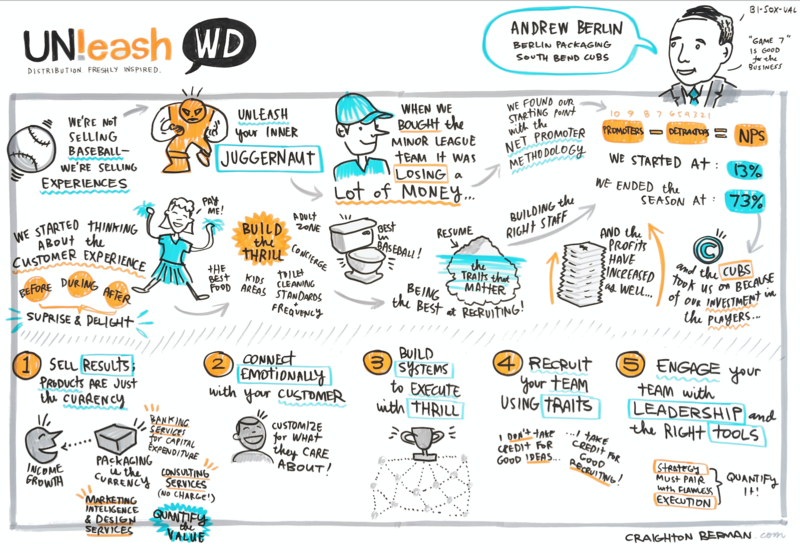 Didn’t know what I was going to come out with… but I started filling flip charts on my wall and out of that came a framework for UnleashWD Innovation Summit (directed by having attended the BIF Innovation Summit in Providence RI about 6 weeks before). I do remember the feeling of empowerment and the release of much what was holding me back – by taking it upon myself to at this moment not listen to anyone but myself. My gut. It was me looking in a mirror if you will. I wasn’t there for anyone but myself at that point. This was about me. About defining what I could create to fill a real void in the world. And … to fulfill me. Nor did it feel good to have to layoff three employees. But … we created something GREAT. Something that would never have come to the industry if it wasn’t for that Saturday in my office. The only thing missing was the profitability. Another decision to be made. The easy thing to have done would have been to listen to everyone else. But I look in the mirror every morning and had to do what I thought was right. Right for the business, my family, my wife, the industry, and yes… right for me personally. It came down to belief. I believed in what I was doing so much, that I made the decision to share the “bad news” with my wife and others that the path forward is the path that we just lost $150,000. So yes while there is the intangible of “faith” in my belief … its time to work harder than ever before. I had to work on myself as I worked on the idea. The pressure is there … much like those that attend UnleashWD. But… while there might be some quick wins the real learning and growth comes from the commitment, surrounding yourself with others who think BIG like you, who are the crazy ones, those that have broke through some of the hurtles you need to break through. What I know by being around others that want to change the world is that it can be done. It has been done. And it’s being done (now to steal from Steve Jobs) by people no smarter than you and me. So speaking of Steve Jobs, I’m sure you have seen his Stanford Commencement speech. He has the real answer to your question. He reminds us that you can’t connect the dots looking forward – only by looking backwards. You take an action and truth be told, you don’t know what’s going to happen. You can plan, strategize, hope … but in the end the outcome is unknown. You can only see how things lined up for you by looking backwards. After you take action on what you believe. My interpretation: take action. Do something today. Move “it” forward just a bit. Do something. Anything. And guaranteed .. in that action will be a lesson. Something learned. And that action will connect to another action. It will inform what to do next – right or wrong, something to do next. A couple of examples … and I hope this is addressing your question How Did I know this was the way to go …. So let’s take a few things from UnleashWD. Todd, I know this might sound like, what do they call it … pride of authorship, but … UnleashWD is far and away the single best annual conference for distributors. Every other conference in the industry has its place and they do great things and serve their purpose. That said, every distributor and every leader who is charged with the future of their company should be at UnleashWD. I believe that down to my core. So one thing that is pretty cool at UnleashWD is our Lift and Shift™ sessions after each set of three speakers. This is where we have three speakers sit on the edge of the stage, real informal and intimate contact with the audience and we lead a discussion between the speakers and the audience members. So the audience members can take what they heard from the speaker (all who come from outside distribution) and think through this non WD idea to “lift” it from another industry and then begin figuring out how to “shift” it into their distribution business. It really is pretty damn cool. So how did I come up with the idea? Remember those flip charts in my office, three or four of which outlined the two day summit that became UnleashWD. Well that model said we would have four speakers and take a break. Then another four speakers and go to lunch. You get the point. So why did I want four speakers and a break. Because that is how the Business Innovation Factory – the innovation conference I modeled UnleashWD after, did it. It worked for them, so it would work for me. Until, I didn’t get any registrants and had to pay my speakers. Oops! So I had to save money. Cut from four to three speakers per session … and find something to do with the extra 30 minutes. And thus Lift and Shift™ was born. So … to your question I didn’t know I was going to end up where I’m at. Let’s go to the podcast, cause I know that’s on your mind. I knew I wanted to do a podcast. I believe every business (mine included) needs to be digital and needs to be a publisher. I saw the rise of podcasting, I believe one of my unique abilities (that’s strategic coach coming out in me) is my curiosity and desire to learn and another to lead conversations (I’ve been doing that in training and workshops for 30 years – who would have known that it would pay off in the form of a podcast?). So Innovate For The Future.FM was born. But what about getting guests, with my travel, limited bandwidth etc. Again constrained. I looked around at what I had, and I had this model of The Innovative Distributor™ – something I believe deeply in – something I stand for – right? So the model of finding one guest for five episodes was born! I didn’t know that when I started out, but looking back as Steve Jobs says, that action I took three years ago approaching the NAW to do a research project on innovation, through which I discovered The Innovative Distributor™ model came back to payoff again. I call it my 3M Post-It-Note Moment. The “rule” I have for curating my speakers for UnleashWD – so that we inject new ideas into the industry and the individual’s business attending – is that this is an industry conference with no industry speakers. No one from the distribution industry speaks. I half joke that if you know what the word “supply chain” means, your not invited to speak on my stage. But wait … two years ago Dirk you had Andrew Berlin, Chairman and CEO of the distributor Berlin Packaging as your opening keynoter. And wait, last year you had Don McNeeley, CEO of distributor and steel service center Chicago Tube and Iron speak. And wait, this October you are going to have the COO of Winsupply Monte Salsman open UnleashWD with a keynote. So what happened here. Again take an action and something happens. Andrew Berlin, in addition to being the CEO and Chairman of Berlin Packaging is the owner of The South Bend Cubs. His story of buying a failed franchise and leading it to being one of the best run professional sports teams in the country captivated me. I wanted to hear that story and then I said … If you want, then take the last 15 minutes and share how you have built Berlin Packaging into a juggernaut. Well, he was amazing and here is what I learned. Beyond his story, beyond the lessons, and tools he shared, beyond getting us all to look at business in new ways what dawned on me two days after the conference concluded was that the greatest accident in UnleashWD history had just happened. A hurdle so many have a hard time getting over is “what can someone from outside the industry teach me about building my distribution business.” Even those that come to UnleashWD for the first time, have that in the back of their mind. What happened with Andrew was he told the story of the South Bend Cubs, and in essence then said that everything he did with a professional baseball team, he first perfected in a distribution company. So without me having to say anything – immediately a key obstacle to learning and getting as much from UnleashWD as possible was obliterated. It worked in professional baseball. It can work in my business too. Brilliant! Yet it was accidental. But I took an action and a bit of a risk because for three years I’ve been declaring no one from distribution on my stage. And here I was putting someone from distribution on my stage. So my 3M Post It Note Moment is that if its right, I find the right brilliant individual within distribution who has another story as well, I kick off UnleashWD with this individual to obliterate any obstacles to soaking it all in from the very start. Don McNeeley teaches the capstone course in the engineering department at Northwestern University. There is a story. Monte Salsman, I know no other individual at his level in distribution who is so focused on personal growth and development. He like Don and Andrew amaze me and thus I want to hear their stories … and at the same time we launch the two day summit in an unbelievable way. I alluded above without using the word is willingness to take a risk. When I was losing $150,000 year one I refused to cut the video taping of the summit. Also, just three days before the conference, I decided to hire our graphics artist – the gentleman who captures every presentation in a graphic format. Thank God I’m not a numbers man, because any accountant … and every staff member and family member of mine said don’t do it. We are already losing money they reminded me. But… those were two of the best decisions I made. The graphics on site immediately differentiated UnleashWD from every single conference the attendees had been to – at any time throughout their career. One other… I didn’t know I’d end up here. I’ll jump ahead to this fall – September timeframe. If the stars align I’ll be publishing my next book. When I launched the podcast Innovate For The Future.FM, all the podcast conversations and training online talked about the pros and cons of providing transcripts as downloads. Should they be gated or not. Well the podcast, right now going into month ten, is not a revenue generator. So it’s hard to justify (to those accountants again) the $1.00 per minute I spend for the transcription service and the 2 – 3 hours I spend every episode reading, formatting, highlighting, and positing these transcripts. You’d think I’d have someone do that right? But I do it for every episode once I get the transcripts back. The learning is amazing! What I have found is that my original premise about interviewing brilliant people has been right. These individuals are brilliant, innovators, and leaders. And they are sharing their secrets with me and my audience. A little more work – because in the end these are not just podcasts, they are research – and the show becomes the research platform for a steady stream of relevant content … and my next book. I didn’t know I would be publishing my second book in two years this September, but again, stars align, it looks like it will happen. Todd, I hope this helps you. I know it helped me … so thanks for the question, and I’d love to keep the conversation going. There’s more to learn! And… more dots to connect in untold ways. So feel free to comment below to keep this going. Wow. So many things. Thank you for the inspiration. Also, thanks a lot for keeping me up so late reading and composing some more questions for you. What do I believe in? That people can be inspired in their work. I dare to declare that caring for people, operational excellence, and sound financials are not exclusive. Content pivot – I don’t have that yet. Anyway, thank you so much and I know this answer will help others. I think the message resonates for what we are discussin here. Dirk, We sometimes forget that, in the majority of industry challenges, the solutions are found outside of the industry! ! Some say as high as 92%? Cross strategic application has/is many times very fruitful! Love it Allen! Yes we must Lift and Shift™ from our industries. I really believe the solutions to let’s say the distribution industry will not be found in the distribution industry. Your term of Cross strategic application. would love to hear more. Thanks!